We are too caught up in wanting stuff now, rather than saving up and buying stuff when we can afford it. These habits naturally lead to way too much debt, but with enough discipline and help, we believe anyone can get out of debt. 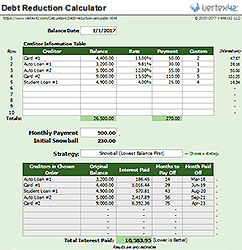 Our free debt reduction calculator, featured below, was designed to help individuals and the professionals that advise them to quickly and easily come up with a plan for eliminating debt. It may not be as easy to stick with the plan, but at least we can help you get started. How fast can I get out of debt using the snowball technique? 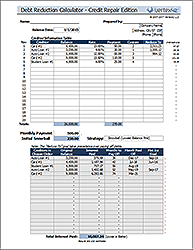 This is possibly the most valuable spreadsheet on this entire website! Pay down your debt to improve your FICO® credit score. 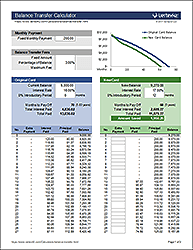 This is an expanded, more advanced version of the Debt Reduction Calculator. 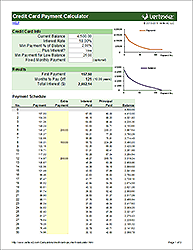 Calculate the payment required to pay off a single credit card in X number of years. Find out how much it really costs to make minimum payments. 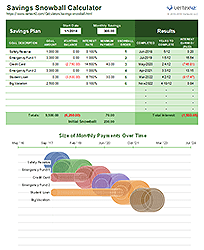 Use this spreadsheet to estimate how long it will take you to reach your short-term and mid-term savings and debt payoff goals. 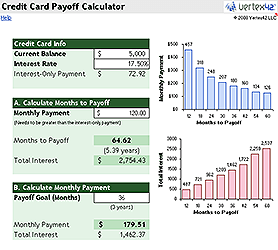 The focus is on savings, but it is based on the debt reduction calculator, so it lets you include debt payoff in addition to your savings goals. 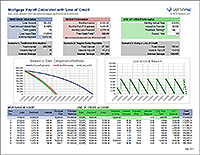 Use this calculator to evaluate the mortgage payoff acceleration strategy of using a line of credit to make extra payments with optional paycheck parking.